Disability is a complex phenomenon representing an interaction between one's physical impairments, the activities they need to perform, and the architectural barriers within the space in which this situation occurs. The terminology and jargon used for disabilities evolves regularly whereas, "handicapped" is no longer acceptable. It is no longer merely a description of intellectual or physical impairments. Each individual with similar impairments describes his or her limitations differently. The blind don't experience their world the same as a person with deafness and so on. The new evolving concept known as Universal Design and specialized handicap remodeling contractors for home remodeling is catching on nation wide and has been for several years as a sign of the times. By 2019, all the 76 million baby boomers will be age 55 or older at a time when many people are planning for retirement. Universal design techniques used in building makes a home more accessible to all regardless of their mobility or adaptive abilities. An evolution of new products used for disability home modifications is making those homes more accessible and has finally come about in the remodeling industry. These new advances in accessible home remodeling in Austin not only keep the living environments safer but will not compromise the home's aesthetics. Bathrooms can be both functional and attractive when planned with elements like cabinetry that allow someone to sit at a sink. 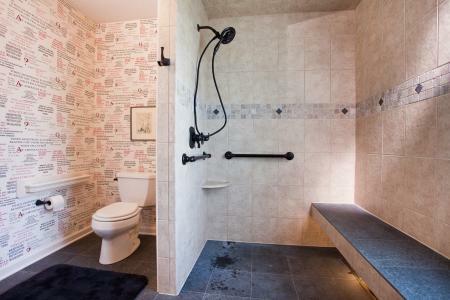 In fact, there are many benefits to using universal design techniques, including potential use by aging family members, added resale value appealing to multiple generations, and the fact that you'll be creating a space that can be used by anyone who visits your home, regardless of their range of abilities. Simple universal design updates for aging in place home modifications and handicap bathroom accessibility can include adding grab bars or handrails throughout the home, custom tub to shower conversions, adding a seat within the roll in shower, lowering upper cabinets and counter tops, adding non-slip flooring, widening hallways or installing stair lifts, and widening doors. You might also consider lowering light switches and thermostats and installing easier to use door knobs. Many considerations should be taken into account to provide safety and independence. You should try to provide a clear barrier free path or accessible route to the most visited areas of your home as recommended by the ADA. The three areas needing improvement for a person wanting to age in place is the bathroom, the kitchen, and the family area. Your existing bathroom may feel claustrophobic. The solution may be to either rearrange the existing space or design a more accessible bathroom which extends beyond the existing bathroom layout. The second way will give better access for walker or wheelchair turns and approaches to all bathroom fixtures. You may have to give up a closet, porch, or part of another room to accomplish the best result. Bigger is always better when mobility devices are being used. Curbless roll in showers are advised for everyone on a universal level and not just for the users of wheelchairs or walkers. At the very least, observe a low profile shower base of 2" or less in height at the curb to keep people from stepping over into a walk in shower. 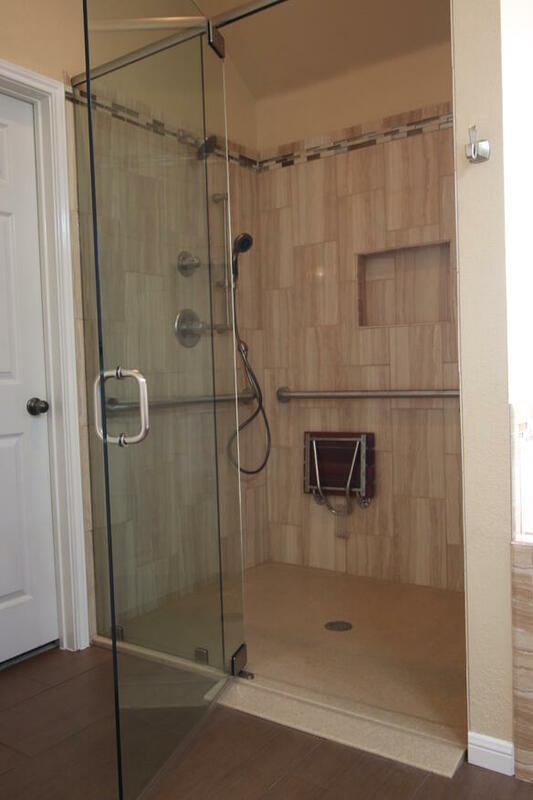 The wheelchair accessible or universal designed shower should contain at least a shower wand mounted on a sliding bar to be available for varying heights of use coupled with a regular height fixed shower head. A diverting valve should be used for controlling each head. Remember you are burying the valves within the walls of the shower so choose high performance brands of fixtures when making your choices. 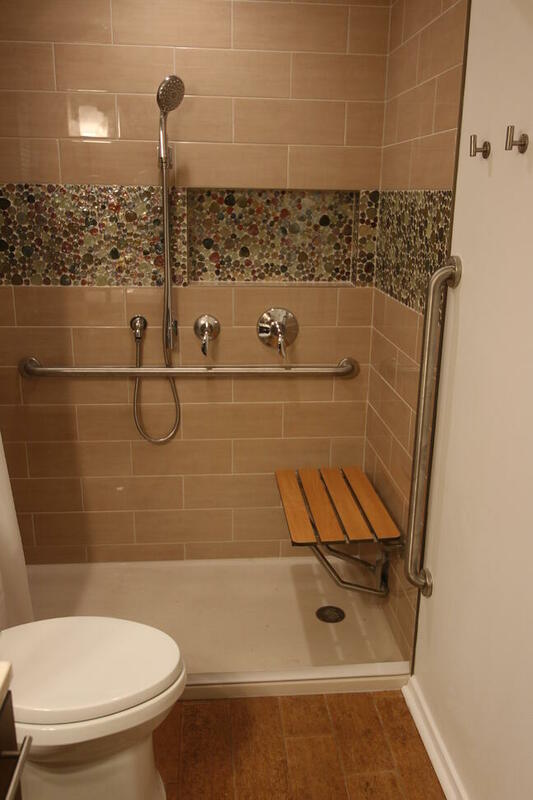 Folding seats and benches can make your shower more enjoyable and safe. They are also useful if caretakers are involved or temporary assistance is needed. Secure grab bars withstanding 250 pounds of force located around the shower perimeter will increase the safety factor and prevent falls. Grab bars should be installed at 34-36" height above the floor. 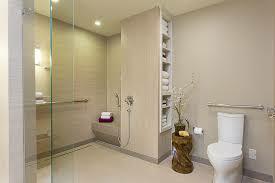 Shower niches 48" above the floor will help prevent clutter aiding in fall prevention and safety. All of the bathroom floor surface must be nonskid to prevent slipping on a guaranteed wet floor. 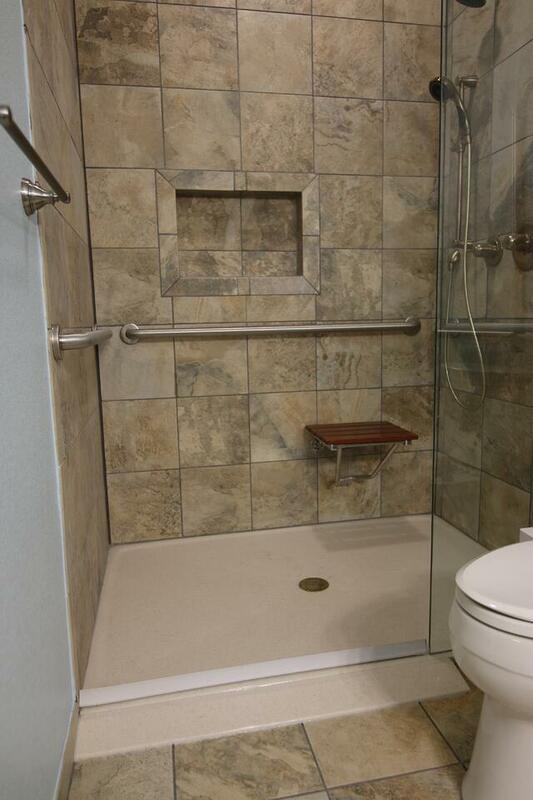 A true ADA compatible roll in shower should be 60"x60" for the total floor area when possible which will provide additional space for caretakers. A minimum of 48"x48" is a little more cramped but is acceptable by VA guidelines. If a tub shower conversion will be executed then the depth of the new shower should be no less than 30" clear. 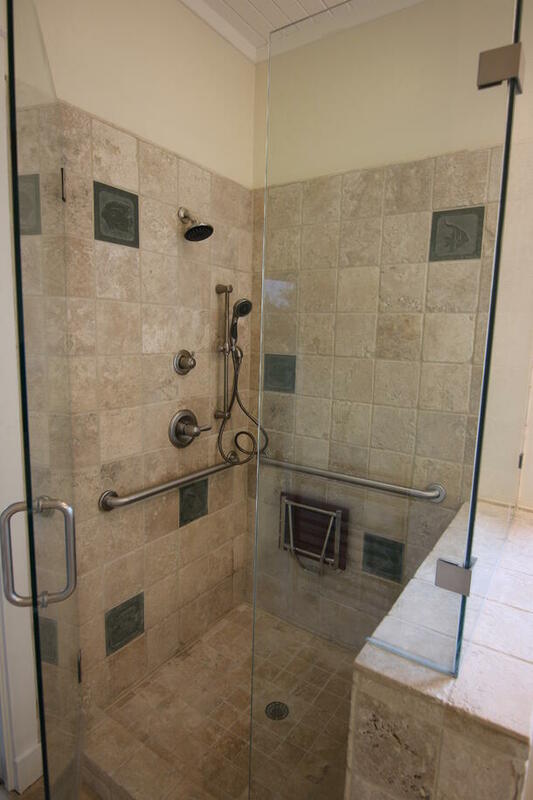 A glass enclosure will provide a revived look for your new shower. 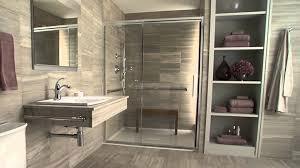 The more expensive frameless models will bring your bathroom completely up to date. 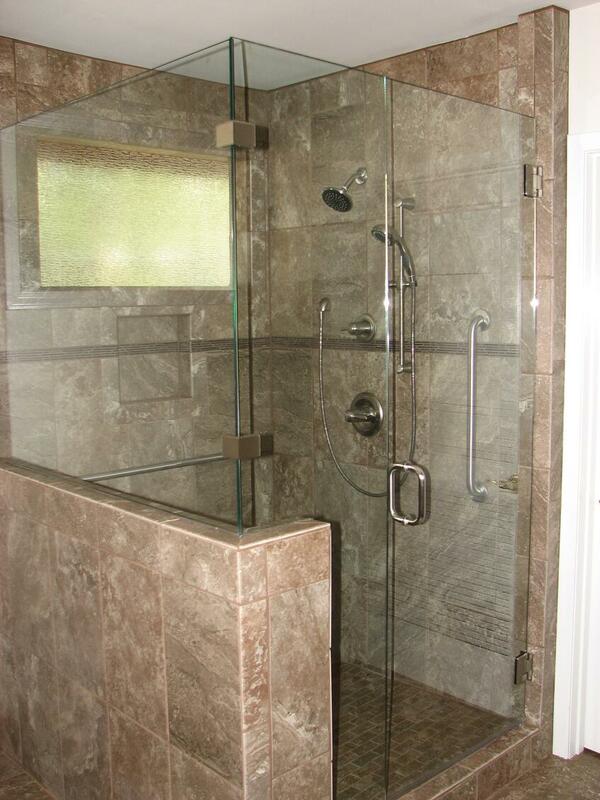 A single splash panel or wall can be installed toward the shower head wall. Any shower entrance should be no less than 32" in width but remember wider is better when it comes to accessibility. Glass is available in many finishes and textures but clear is the most popular choice. Lighting in the shower is also very important. An LED recessed shower can light should be installed in the shower ceiling. Additionally, concealed colored LED lighting can be used in the shower for mood. There can never be enough lighting when performing tasks while showering or during clean up. 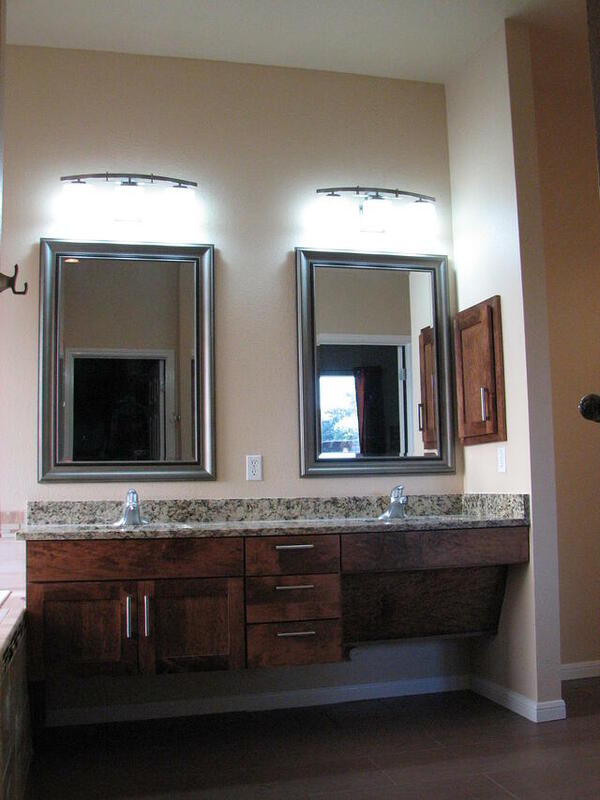 Light strips or single wall fixtures can be designed around the new framed beveled mirror that you have chosen. The choice of bulbs utilized is yours for now at least. Try using dimmers to control your new lighting. Ventilation is so important when planning a bathroom upgrade because of the humidity involved. Too many times a single exhaust fan is installed above the toilet, or what is much worse, in the center of the room. Heat and humidity naturally rise and will overtake the entire room if given a chance. Today's quiet bathroom exhaust fans should be sized according to the room's air volume. They should be located above any bathing or showering facility and above the toilet. Conditioned air along with adequately sized duct work supplied by your central unit will further accentuate a pleasant feeling within the bath. Who do you choose to help you with your dream? It is true that a professional remodeling contractor with years of experience will cost you more than a handyman illegally playing among the trades at your peril but then again there are those professional guarantees to consider. The professional verses the handyman is more likely to seek your overall satisfaction that will follow him into his next job. A true building professional can also orchestrate the job's smooth flow limiting the down time of a most useful room. Subcontractors will not be covered up and each skilled trade is brought onto the sight as needed in an orderly fashion. Professional builders normally have insurance to cover on the job accidents to protect the homeowners from having legal action brought against them personally. Be sure you ask for a certificate of insurance from your chosen professional contractor so that you aren't held personally liable for medical experiences covering a worker's accident while on your property. I tell my customers all the time that one of their main ways of choosing a reputable contractor with a good track record and BBB experience rating is the ability for them to do work with the particular residential building contractor they are interviewing. Can they communicate easily relying on the contractor's experience and reputation and can they get along throughout the sometimes long and detailed construction process? Are they compatible as human beings because the only energy that should be spent during the project should be directed toward it's completion. The National Association of Home Builders, in partnership with the AARP and Home Innovation Research Labs, created the CAPS program, which includes training and education on the technical, business management and customer service skills essential to compete in the fastest growing segment of the residential remodeling industry--home modifications for aging in place. David L. Traut, CAPS the owner of T-Square Company in Austin, Texas is one of the select group of professionals nationwide to earn the Certified Aging-In-Place Specialist (CAPS) designation, identifying him as a home remodeler and builder with the skills and knowledge necessary to remodel or modify a home to meet the unique needs of the older population, disabled owners or their visitors.